Dhaka Premier League table toppers Legends of Rupganj coach Aftab Ahmed said on Saturday that they are not thinking too far ahead and would like his charges to continue with one-game-at-a-time mantra. Legends are surprise table-toppers of the ongoing DPL after the first phase and would take on as firm favourites to clinch their maiden title under the guidance of former national batsman Aftab. This mixture of experience and raw talent has thus far done the trick for Rupganj, propelling them four points clear of second positioned Prime Bank Cricket Club at the start of the Super League. ‘I have been saying this from the beginning that we were never aiming for the trophy. Our aim was to go one-by-one. This is our slogan,’ Aftab told reporters when asked about his title aspirations on Saturday in Mirpur. 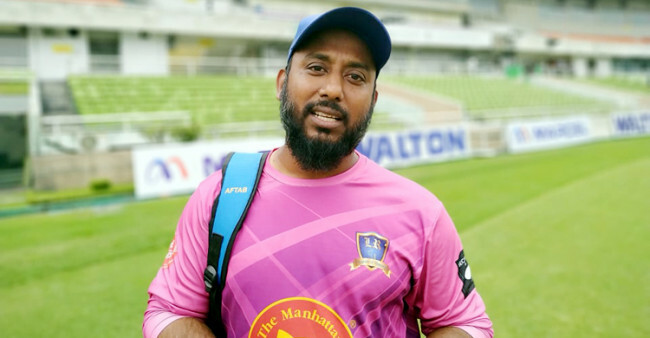 The former whirlwind Bangladesh batsman, who is coaching a DPL side for the first time, further explained his side’s approach in the tournament of focusing on their own game without thinking too much about their opponents and looked to carry on this approach in their upcoming Super League fixtures. ‘Our first match is against Mohammedan [Sporting Club]. Our aim will be to win that game and then think about the next match. ‘In the batting department, they have Liton Das, Raqibul [Hasan] and Abhishek [Easwaran]. Sohag Gazi also won them a few matches. So, we have no scope to relax even if we dislodge their first five wickets,’ said the 33-year old. Rupganj acquired the services of pacer Taskin Ahmed late in the tournament, right after the pacer recovered from an ankle injury he sustained in February in this year’s Bangladesh Premier League, and played for them in their final first phase game. ‘We are playing Taskin [Ahmed] only if he is a hundred per cent fit…. Even if he was 70 per cent fit, we wouldn’t have taken the chance. As we have a good chance here, we can’t afford to take a risk.